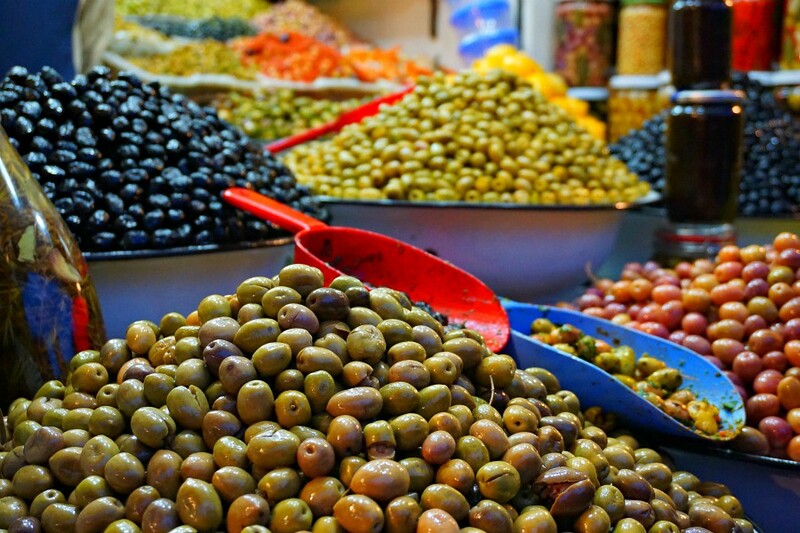 This Marrakesh food tour took us deep inside the center of the old city and allowed us to explore the real flavors of Morocco. The setting was as compelling and mysterious as the food and I wonder how many people who haven’t been led specifically behind the doors that we explored, leave Marrakesh without really knowing the food of Morocco. 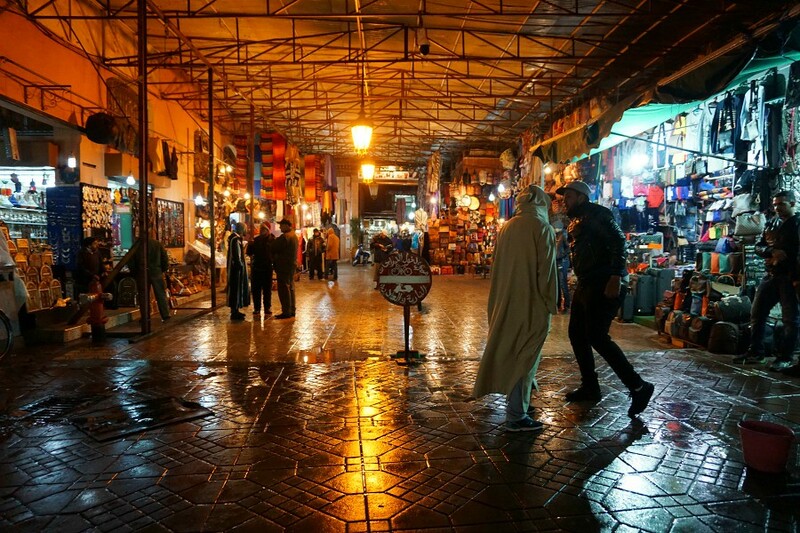 On this night we went down small alleys of the Medina (or old city) and were invited into establishments that have been passed down by families through generations. Without our guides, I never would have ventured inside and certainly wouldn’t have ordered many of the things that we tried today – an opportunity that I am glad to say I did not miss. 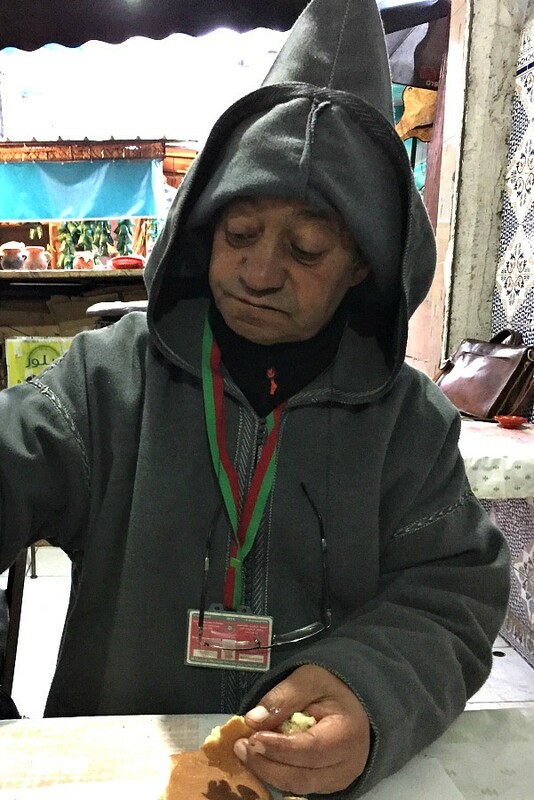 Our tour guide, Youssef, who grew up in Marrakech, along with his wife Amanda, scoured the Medina and selected a menu based on traditional foods that he grew up with. 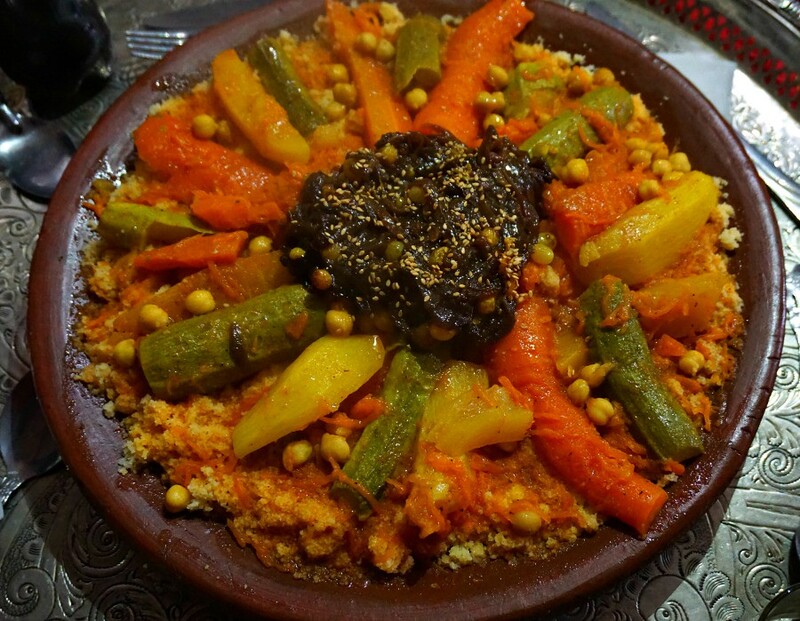 Before adding a stop on the tour, they asked themselves, would Youssef’s mother eat this food? I can tell you easily that she wouldn’t eat THIS MUCH food – we were about to embark on a walking feast. 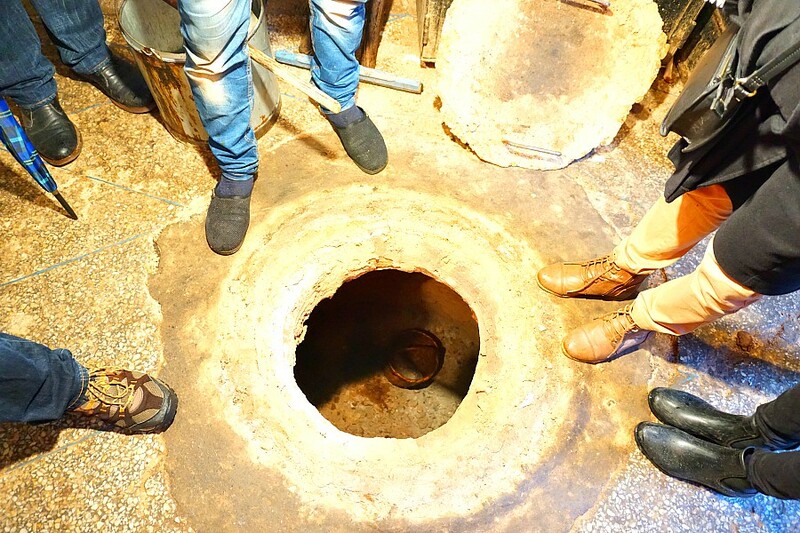 So if you decide to take this journey, bring a strong sense for adventure, a big appetite and comfortable shoes – you will need all three to fully appreciate this food tour. We ventured into the Medina, passing by the Souks (shops) and began to experience the sights, sounds and smells of the old city. The confusing maze of tiny streets is actually well-organized small communities where people have lived and cooked together for centuries. Behind one door you can find the bread baker, who not only supplies his neighborhood restaurants and stores with bread, but also bakes loaves of bread for his neighbors. 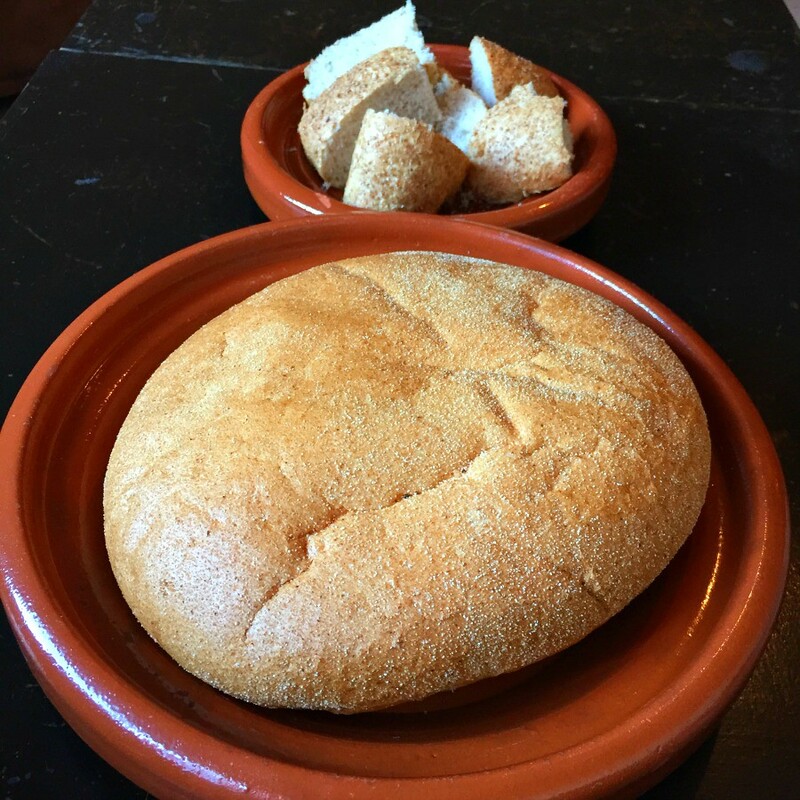 The traditional bread, a round dense loaf, is baked in a wood fired oven. 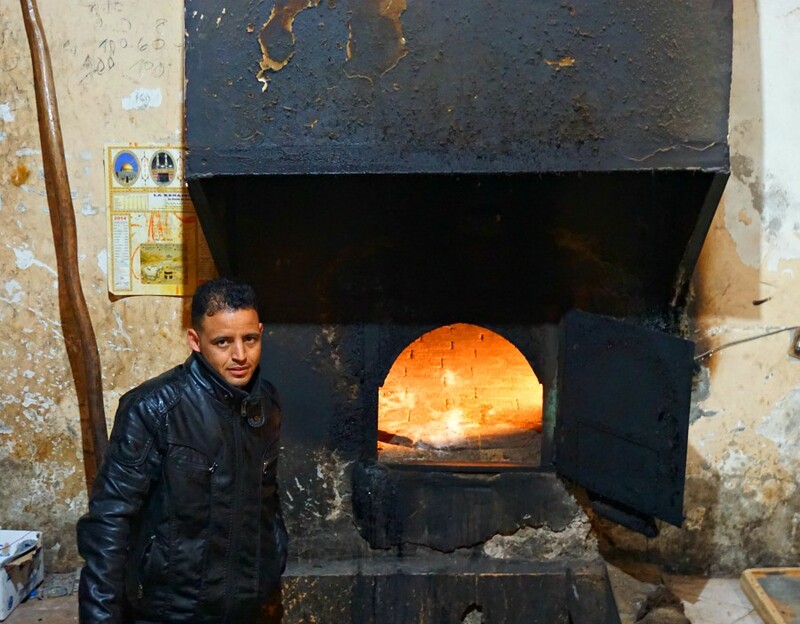 According to Youssef, the baker is the ears and eyes of the community. Before you marry it is wise to ask the baker what sort of family you are potentially marrying into – he will know. The bread (Khobz) is a crucial part of the food and the culture here. It is often used instead of a fork to scoop up bits of slow cooked meats, as demonstrated by our official tour guide who accompanied us and shared samples with us along the way. The bread is actually considered sacred and is never thrown away, but shared with the needy or fed to animals rather than being sent to the trash bin. We were given our first chance to try the bread at our first stop at another communal cooking establishment. Here whole lamb is prepared (actually, typically several of them at a time) in a huge underground oven. 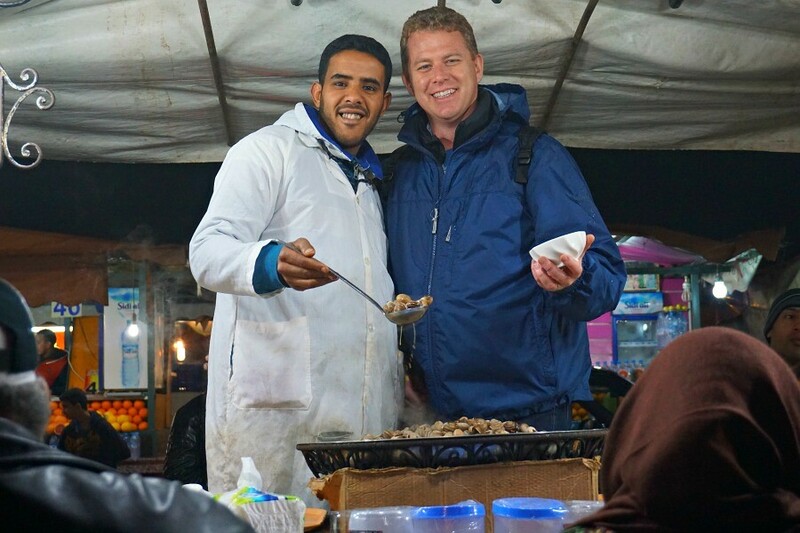 The more adventurous of us on the tour also sampled some roasted lamb head – which our Moroccan guide assured us was the best part – he was more than happy to demonstrate how to find the most delectable bits. 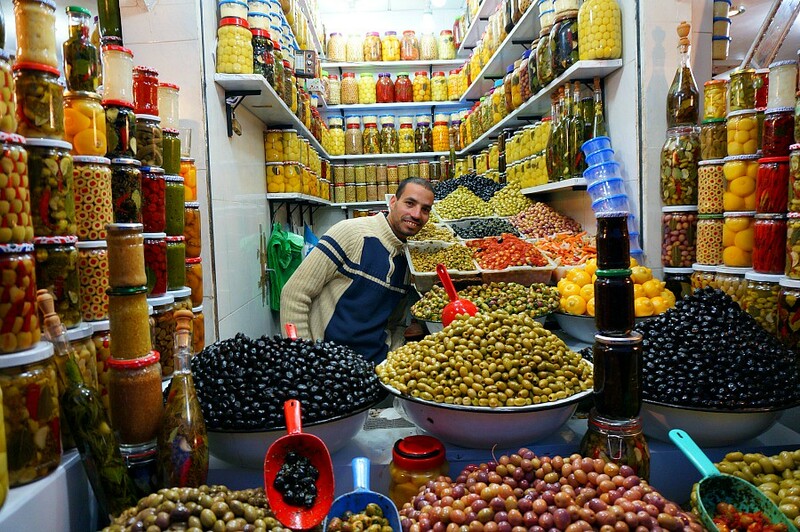 After finishing off the lamb, or small group headed to one of the many shops selling a variety of staples, such as olives and preserved lemons and in another stand fresh mint and herbs. All crucial to Moroccan cuisine. 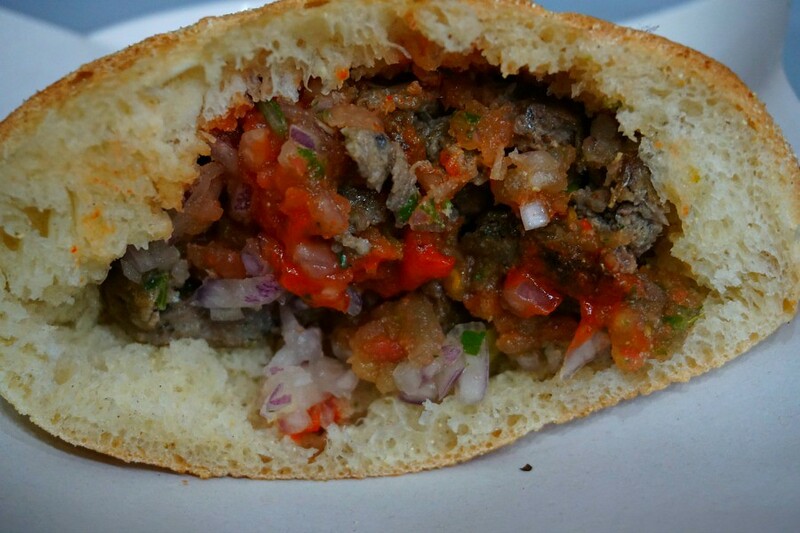 We next stopped at a shop selling savory Moroccan fry bread called Rghaif or Msemen. 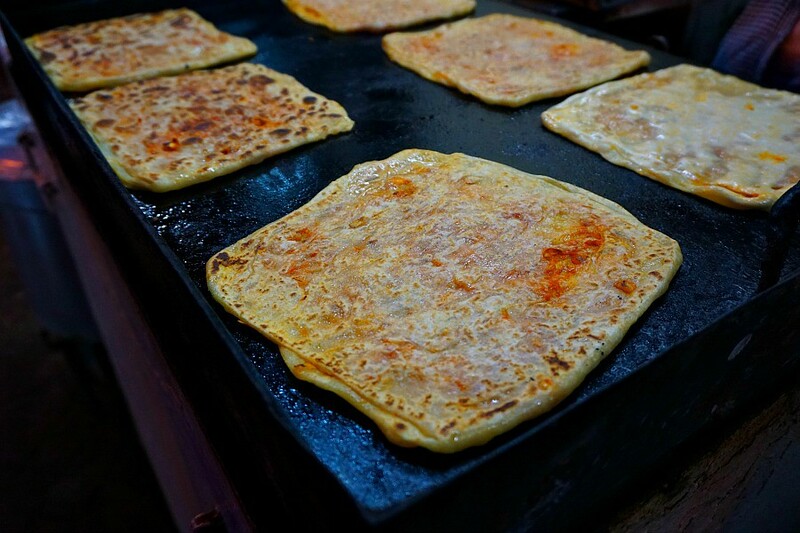 The soft and chewy dough is often filled with vegetables such as grilled onions or olives and prepared on a hot grill pan. Youssef confided that his mother would make these by the dozen and keep them in the freezer for him. Even though we knew there were many stops left on our tour I ate my entire savory, buttery piece. The next stop turned out to be one of the biggest surprises on the tour for me. 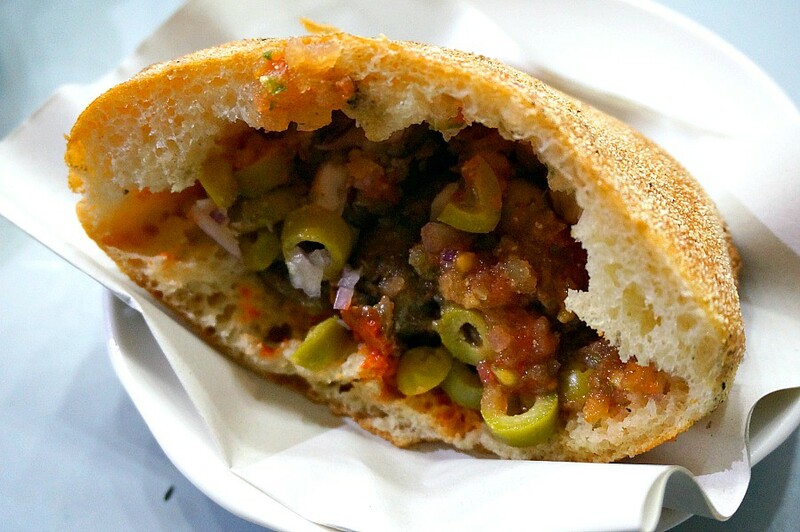 If he hadn’t told me I would never have guessed that the meatballs in the sandwich we tried, all piled into a corner of traditional bread with olives and onions, were actually made with sardines. We slathered on some chili sauce with a light curry flavor (harissa) and once again I ate too much. I could have sworn that the meat was something else, like possibly veal. After the tour Amanda assured me that the sandwich is indeed filled with sardine meatballs and she even shared the recipe (coming soon to our food finds section). They turned out to be my favorite taste of the day. I was already starting to feel full – and we had 4 more stops to go. 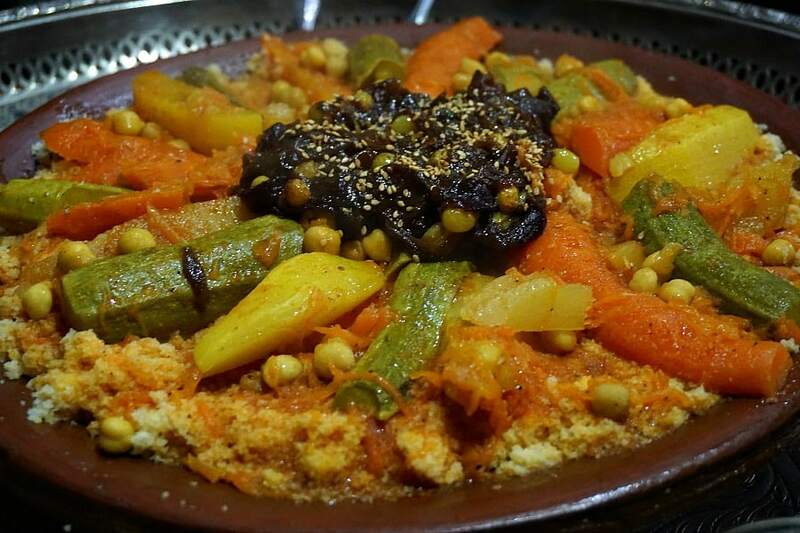 Next we entered a small shop where a group of women were preparing the dish they had become known for – traditional Moroccan couscous. 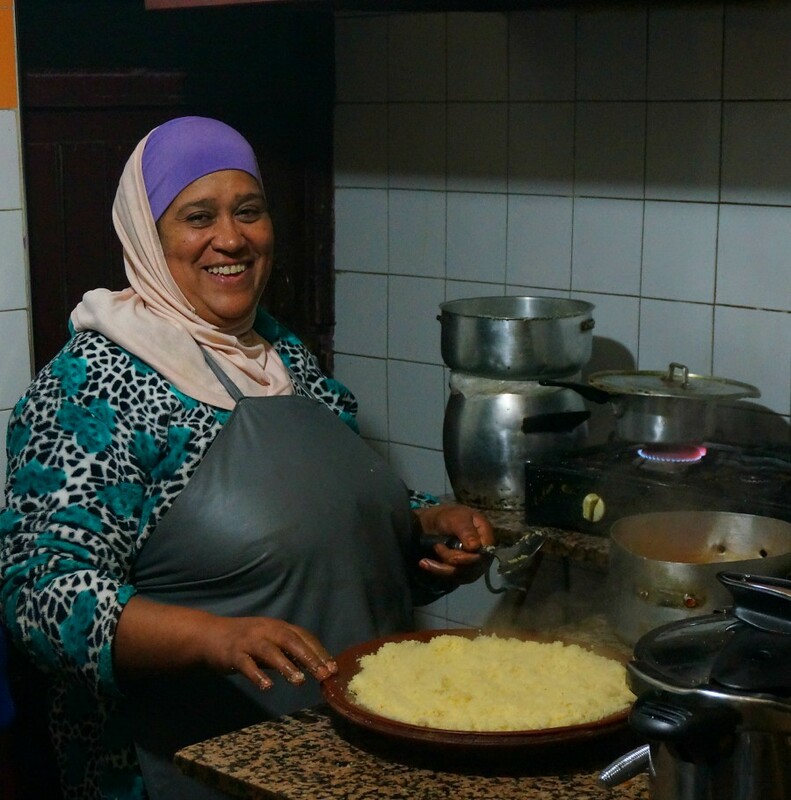 Youssef shared that he and his wife scoured the Medina in order to locate a shop that would prepare a dish that was the most similar to what his mother would make at home. They placed a large platter in front of us – fragrant and artfully arranged. My favorite was the sweet and savory topping made with caramelized onion and raisins. Youssef explained that the proper way to approach sharing this formidable shared dish was to eat in your own triangle, like an imaginary pizza slice. At this point all we could manage was to make a small dent the light, fluffy dish. Luckily our local guide had anticipated this stop and helped us do more significant damage to the dish. Possibly making the best Couscous in Marrakech? After eating what we could we wandered through the Medina, with Youssef pointing out various traditional shops, baths (hamams) and bakeries that were central to life inside the walled city. It was fascinating to later see pictures of the place 100 years ago and see that many things on the face of the old city still looked the same. On the evening of our tour it was actually raining and a little cold. We stopped and warmed up with another local delicacy, snails in a hot spiced broth. Even if you aren’t interested in sampling a snail, the spiced broth is wonderful, particularly on a cold evening. Our friendly snail vendor, unlike many Moroccans, was not camera shy at all. On our next stop Youssef, knowing that we were likely getting pretty full and that some of us were less adventurous that others, offered a taste of a local delicacy from another street vendor. A spleen sandwich – hmmmm. When we stopped in front of the street vendor two of the women on our tour laughed, because they had wandered by earlier in the day and tried a sandwich having no idea what it was. “It was spleen!” they shrieked. And, as they indicated, it was a delicious concoction of ground beef and other organ meet combined with spices and cooked in a cow spleen, called Te’han. Cow spleen – who knew? 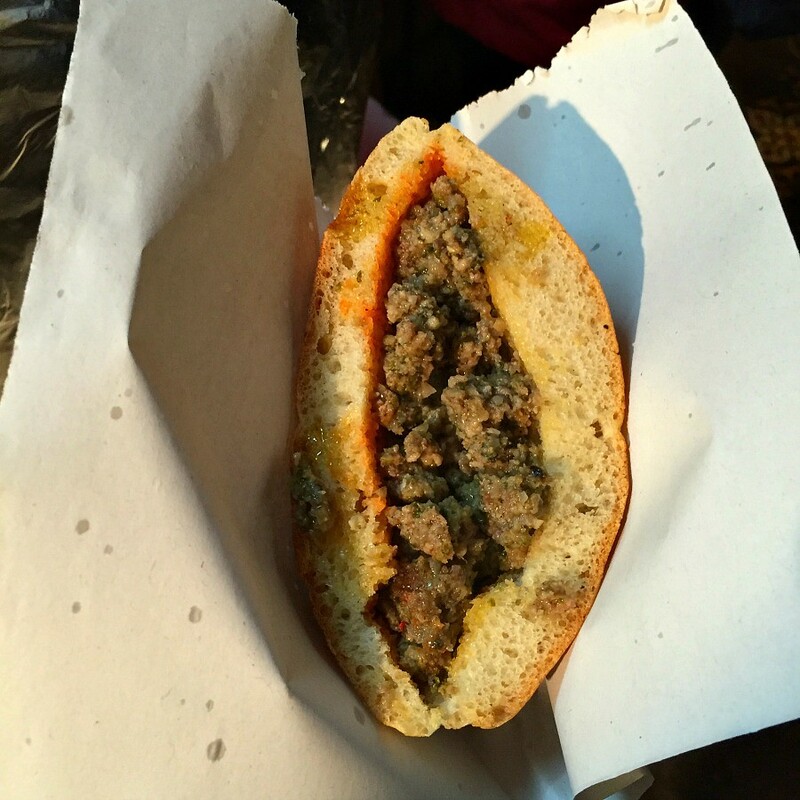 Spleen Sandwich – Surprisingly Delicious! 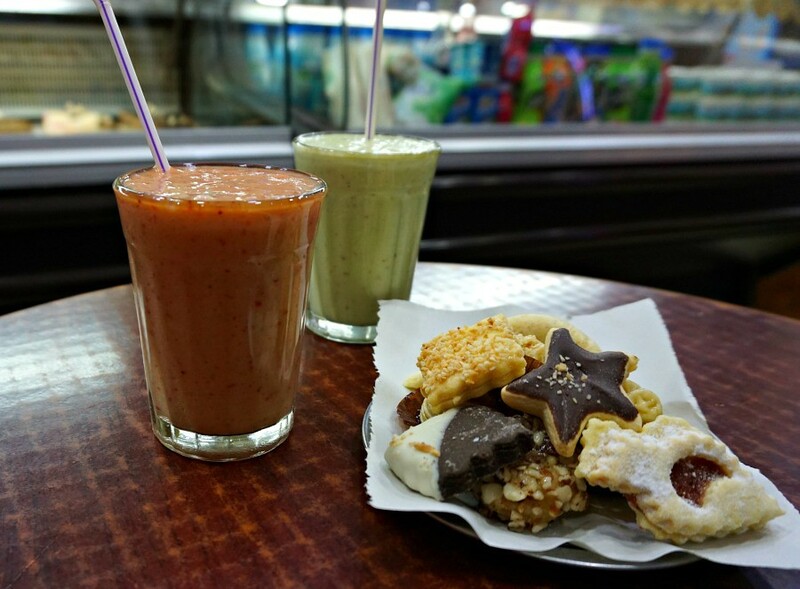 Our final stop was at sweet shop selling traditional fruit shakes and cookies. At Youseff’s urging we tried a traditional shake made with avocado and almonds, a surprising mixture that turned out delicious. And despite both of us being totally stuffed, we tried a nibble out of each and every cookie that was mounded on a plate in front of us. As we wandered home, full of the sights, sounds, and tastes of the evening, I reflected that even after having been in Marrakech for a few weeks, I hadn’t really tasted the red city. Until now. I am glad to have had the inner doors of the Medina opened for me. And if you ever find yourself in Marrakesh, give Amanda and Youssef a call and give yourself the opportunity to visit the Medina as a traveler, not a tourist. Planning a trip to Marrakesh? Pin it for later! A special thank you to Youssef and Amanada of Marrakech Food Tours who hosted us on the tour. As always, our opinions are our own. 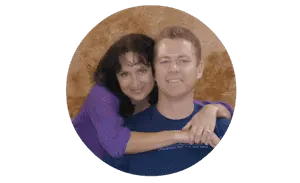 Note: Some of the links on this page are affiliate links, which means that if you click on them or making a purchase, we may received a small referral fee at no cost to you. So click away, and if you do – thanks so much! We appreciate your support. So great! Thanks for sharing this unique experience! I really love food tours too. My strategy is usually to get my husband to eat half of what we’re given to sample. That works out great for me, but typically by the end not so well for him. 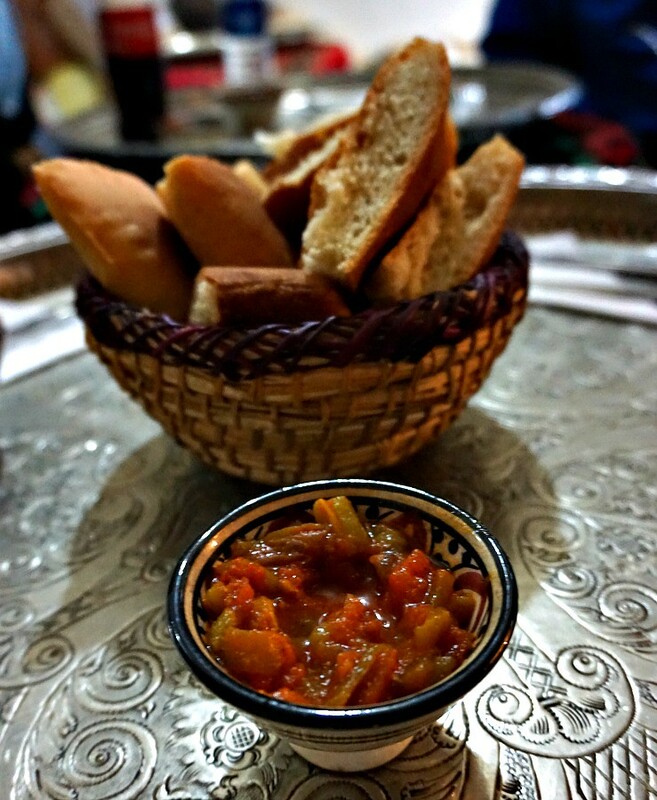 I love the Marrakech food tour, but wonder if my stomach could take all the hardship! What a wonderful tour! Your fantastic pictures make one feel as if they were there. Very well done! That bread looks heavenly and the couscous, absolutely amazing, but the star of your post (for me) is that huge selection of beautiful cookies. NOM. NOM. The cookies were really good! Even after all of the things we ate that day I couldn’t resist. I am literally salivating, Jen! Your photos have thoroughly convinced me that I must go to Marrakech. I have a feeling that if I started taking photos and eating olives at the same time I might not stop. Incredible food tour! Thank you Howard! I’m not so much of an olive fan, but my husband could not have been happier with the selection of olives there. Love the tip about the baker knowing everything that goes on. 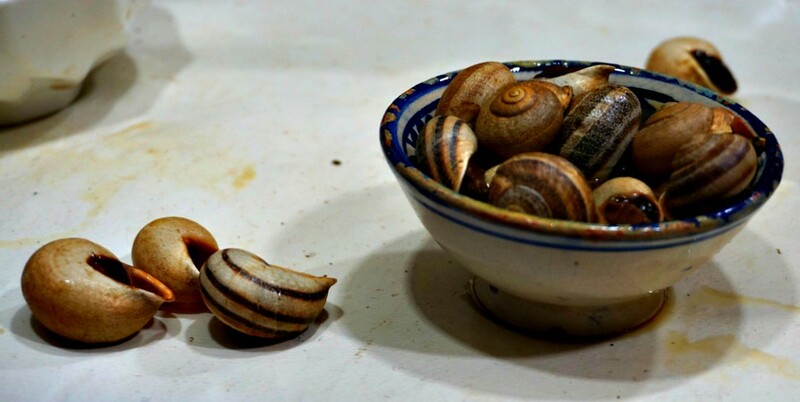 Did the snails have the same texture cooked in the hot spicy broth as they do in escargot? Yes the snails did have the same texture, but the taste was very different. They use cumin and cinnamon in the broth – really unique flavor and so nice on that cold evening. We were planning to visit by the end of this year, I bookmarked your site, will definitely book this tour. I think you’ll really enjoy the tour – let me know how it goes! Haha!! I love that the bakers know all the gossip. And the fact that the tour only takes you to places that Youseff’s mother would eat. That’s how you know it’s authentic food! Oh, how I love Marrakech! I was there for a month in 2013 and had the chance to explore their food scene as well! I just think that most of their food are too oily so I got sick of it I started cooking my own food on the 2nd week of the trip. 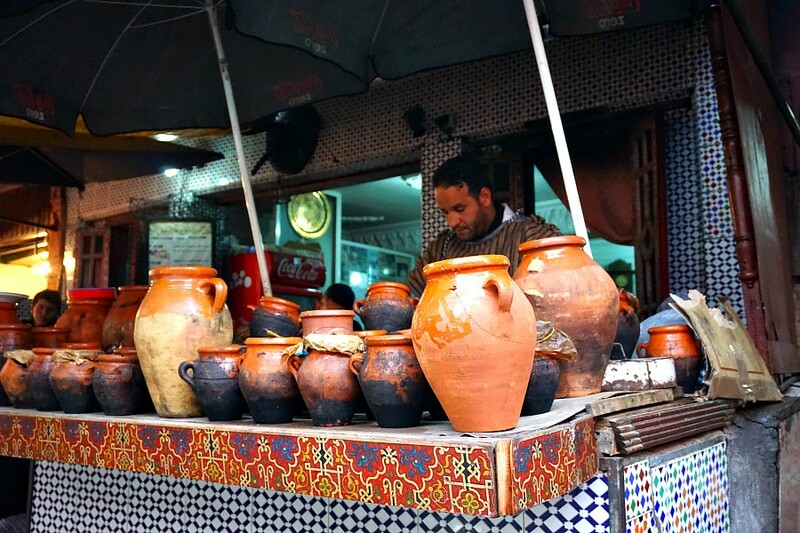 Sorry you didn’t love the food as much as we did – I loved the tagines! I’m so glad you managed to book on Amanda and Youssef’s tour! Looks like you had a great experience! We really love open markets like these. They show us so much life and culture. Those dishes/street food truly look delicious! Mmmm! Those sandwiches, especially Grilled Sardine Sandwich (Hout Quari) With The Works, looked so good. I love Olives and those looked amazing! I love how they never throw away the bread either! No waste! The sandwiches were wonderful. Can’t recall the cost of the tour off the top of my head but I believe it was really quite reasonable, particularly because of all of the food we were able to sample. There is a link to the tour in the post that should provide all of the up to date information. Happy Travels!